On 14 Sep, I suggested that "K-REIT seems to be trading in a 6c trading range recently: $1.16 to $1.22 and $1.22 to $1.28". I also said "in the event that $1.28 resistance is taken out, one could therefore expect $1.34 to be the next resistance level." Today, K-REIT traded at and above $1.28 the whole session. 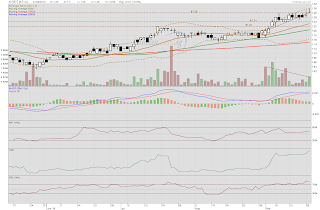 It touched a high of $1.30 before closing where it started the session at $1.28, forming a gravestone doji. The sell queue at $1.30 is formidable. Could $1.28 be the new support? Frankly, a gravestone doji does not inspire much confidence. Furthermore, the attempt to move higher in price was on the back of relatively low volume. In fact, we could see a negative divergence between price and volume clearly. Price is rising on lowering volume. Not too promising. However, OBV shows accumulation mode in full swing. 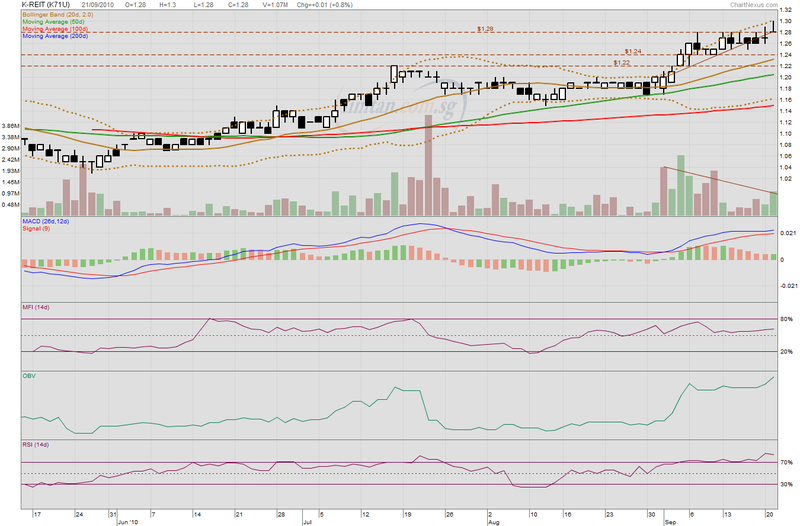 MFI is rising gently and not overbought. RSI is however in overbought territory and suggests that buying could be overdone. Very interestingly, the MACD histogram has turned green, a buy signal but notice that the distance between the MACD and the signal line has been narrowing. So? Caution. It would not be a good idea to buy into K-REIT now. Of course, things could look much rosier if we have an expansion of volume the next day while price moves higher. TA is only about probability after all. Whether $1.28 is now support needs confirmation. That there is a strong support at $1.22 has been established earlier.